Tens of thousands of students have been victims of fraud, left with worthless degrees and often more than $50,000 of federal student loan debt. “The students attended institutions with pragmatic names like the Minnesota School of Business and others whose branding evoked ivy-draped buildings and leafy quads, like Corinthian Colleges,” stated Stacy Cowley from the New York Times. Over the years, the government debt forgiveness program has failed to work. Millions of students who were supposed to get their loans forgiven never did. Instead, their loan discharge applications sat in a backlogged system for over two years. To make matters worse, the Department of Education failed to designate employees to investigate borrower complaints, so millions’ of complaints were just ignored by the Department of Education, leaving students with nowhere to turn. The new student loan forgiveness rule was created in the last few months of President Barack Obama’s administration, but only until recently had this rule been cemented into place. The rule was delayed because Betsy DeVos, President Trump’s education secretary, and the U.S. Department of Education, continued to delay it. 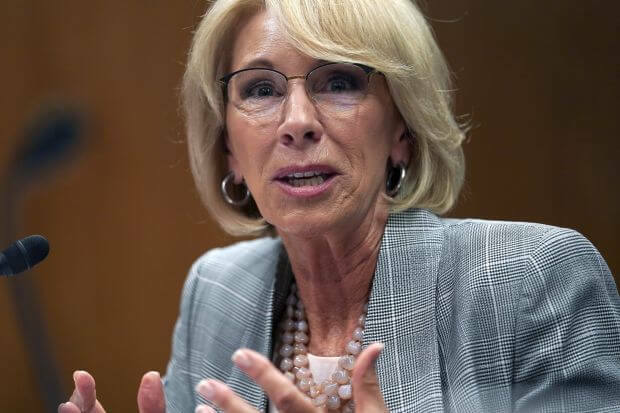 Ms. DeVos continued to argue that some of the clauses in this rule needed to be modified, but critics say that she was only trying to delay the law because she had been part of a multimillion-dollar college scheme herself. The point of this new rule is to allow borrowers who were defrauded and cheated by schools, to be able to get student loan debt forgiveness, and also deterring harmful practices by colleges, safeguarding taxpayer dollars and holding schools accountable for any fraudulent actions that they commit. The Department of Education must create a “clear, fair, and transparent” process for handling borrowers’ loan discharge requests. Right now the process is backed up and can often take months for students to consolidate their student loans and get on an income-driven repayment plan. 99% of students who applied for public service loan forgiveness have been rejected. The entire student loan consolidation and debt relief process is complex, and the majority of students are not sure about how to consolidate and apply for loan forgiveness, but even for those students who did everything right, their loan discharge requests have been completely ignored. The new rule will make the entire student loan relief process transparent, easy for all students to understand and it will expedite the millions of loan discharge cases which have been sitting for years in the Department of Education’s backlog. Any student who attended a college that went out of business and closed down on or after November 1, 2013, will automatically be granted loan forgiveness. These students won’t even need to apply for debt relief; the process is now supposed to be automated. Colleges are now banned from inducing a student to sign a pre-dispute arbitration agreement that waives their right to go to court and bring class action lawsuit against that college. This was how these fraudulent colleges avoided getting sued, by making students sign this type of agreement. Now students can choose where to pursue claims against an institution after claims arise, and institutions can’t ban class action lawsuits by students.